Danum Valley is indeed an ideal location for nature and adventure lovers since jungle trekking, wildlife photography and bird watching are some of the major attractions of this place. This place is basically a huge reserve of lush tropical lowland forest rich in Sabah’s unique flora and fauna and is a home to a variety of ecosystem of the Borneo jungle. The valley, one of the rainforest on Borneo Islands Malaysia, is located at around 83 km southwest of Lahad Datu, Sabah's fourth largest town and is extremely rich in wildlife and huge virgin forests. In general this valley is hilly but not mountainous. Its highest point is Mount Danum, of 1093 meters (3585 feet) in height. In the year 1986, the Sabah Foundation, entrusted with the conservation of the Valley established the Danum Valley Field Centre, a tropical rainforest research and environmental education station. This area is also recognised as one of the world's most complex ecosystems lying within the upper reaches of Sabah's second largest river, the Segama, and its tributaries. The Danum Valley Conservation Area comprises 108,186 acres of virgin forest. The Valley, a primary rainforest jungle, is far removed from human habitation and is known more for its rich variety of plants as well as wildlife – a perfect place for Borneo Malaysia nature tourism. 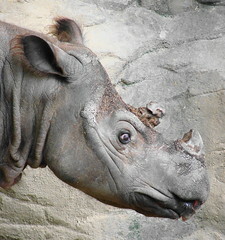 Over here the animal lovers can see some of the extremely rare and endangered species as the Sumatran Rhino, Benteng Elephant, Clouded Leopard, Bornean Gibbon, and Leaf Monkey. Apart from that, even bird species are extensive and varied here with over 275 individual species having been seen here. This place provides its visitors with true ecological experience of the ecosystem of the Borneo jungle. One of the most spectacular waterfall and pools found in the Conservation Area is Sungai Purut Waterfall which is located on the way to Gunung Danum. This waterfall is about 20 m in height with 7-tiered pools. It takes about 4 hours of jungle trekking from the field centre to reach the pool. You can either choose to camp overnight or go for a day trip. The Borneo Rainforest Lodge which was established in the year 1994 is the only accommodation facility available here but it is a world class lodge. 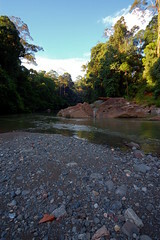 It is situated beside the Danum River, 4 kilometres inside the Conservation Area. If you are looking for more Sabah jungle adventures, you might like to also consider visiting the nearby Rafflesia Hills to have a view of the world’s largest flower and Gunung Nicola, another peak nearby. *Quick Tip: For your safety, please hire a guide from the Centre is you are planning to jungle trek here. This is an ideal destination for all those who are in love with nature and it can provide you a truly unforgettable and inspiring jungle rainforest experience for your borneo malaysia nature tourism trip. One of the easiest and the fastest way to get to Danum valley is to take a flight from Kota Kinabalu to Lahad Datu and then head out towards Gunung Silam and follow signs to Danum Valley. Have You Been to Danum Valley? Share your experience with us - the good and the bad, and your tips and suggestions!